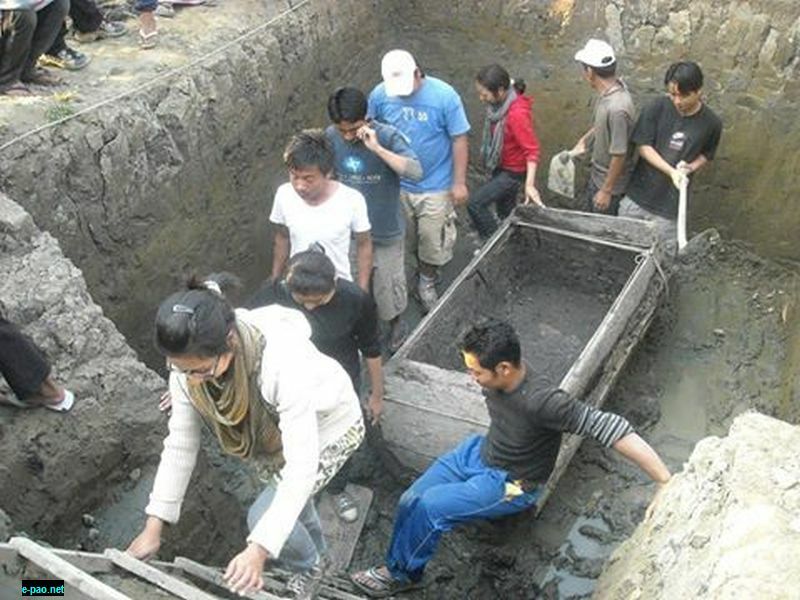 Students and researchers at the Thawan Thaba excavation site where the wooden coffin was discovered. In the quest for finding out the roots of the Manipuris (Meeteis) and its surrounding tribal brethrens, historians, archaeologists and linguists' alike have been consistently looking for historical evidences which will an provide insight into the pre-Hindu culture that flourished in the ancient kingdom of Manipur including the Imphal valley. During such an attempt, the discovery of Sekta burial mounds, proved to be enormous, and shocking archaeological evidences to suggests that the proto-Meitei tribes practiced the culture of burying individuals along with items which are considered necessary by these earliest ethnic groups. Though the hunt for finding such essential evidences have become directionless, possibly due to lack of government funds, lack of equipments and the sites where excavation needs to be conducted, Providence intervened and showed the way on where such cultures of the remote past requires attention. Back in February, 2010, Laishram Modhumangol of Thawan Thaba had engaged some daily labourers to dig a small pit within his land area. The pit, itself was logged with water and Modhumangol never knowing what to expect went on digging till he hit a wooden plank, some 10 feet deep below the water-clogged small pit. Meanwhile, not expecting or having any knowledge about the thoughts and quest of finding burial mounds of proto-Meitei tribes, Modhumangol carried out further digging only to find that wooden plank was much larger and had a gut feeling that it should be reported to the authorities. Wife of the 60-year-old man said they made contact with Porompat police about the findings to which the uniformed personnel came and inspected the site. Understanding that it was nothing related with police affairs, word spread about the discovery at Thawan Thaba to which the state archaeology department immediately understood the significance of it and directed Professor Laishram Kunjeshori of the department of history (archaeology), Manipur University to conduct a systematic investigation on the site. Prof. Kunjeswori of Soibam Leikai soon assembled her team along with students of the department and went to the site to carry out her duties. A prominent archaeologist with decades of expereience, Prof. Kunjeswori was thrilled when she saw the upper portion of the site, and concluded that the discovery certainly relates to a period when Hinduism was not totally embraced by the Meetei community. At the very first, Prof Kunjeswori and her team carefully expanded excavating the portion of the wooden plank during which it was found that the wooden plank happened to be the cover of a coffin which was roughly the size of 6ft X 3 feet. Astonished, when her students opened up the upper cover, it was found that there were no human bones in it though numerous artifacts and items were found inside the wooden coffin as well as offerings. Thrilled Professor Kunjeswori opined the historical artefact must have been dated to the 18th century or either that of the Manipur-Burmese wars. However, she was certain that the coffin must be a man of high prominence or class as the discovery included several offerings which are of no longer used or practiced in modern Manipur. Prof Kunjeswori, during a conversation with this journalist and cultural enthusiast, said the recovered items included hair-pin made of "pure silver" which was of white in colour along with potteries, tobacco containers, rings, plates made of China clay, and insignia of multiple colours which made her assumed that the personality must be of high ranking. When asked about carbon dating the discovered the items to determine the exact time period of the findings, Prof Kunjeshori said due to lack of proper equipments and funds, it could not be pursued any longer. Interestingly, the articles discovered also included a traditional Meetei umbrella known locally as "pae". The findings further made Professor Kunjeshowri convinced that if the origin of the Meeteis were to be traced it should be more focussed on the south eastern region of Asia. She continued, during her recent visit to Thailand, she found various similarities in terms of culture, dress and religious chanting between those professed by the Thais and the Meeteis. Of the findings, Prof Kunjeswori maintained due to the antiqueness of some articles, many other items could not be retrieved as it had become very much fragile. Later, after completing the excavation, the articles were taken by the authorities, which was handed over to the museum, maintained the senior Professor Kunjeshowri. 60-year-old Modhumangol never had any idea of finding these historical evidences when he first started digging the pond. However, he remarked the area happened to be a pre-Hindu religious and godly abode, known as "Laipham" in Manipuri language. When the word of discovery spread out, hundreds and thousands flocked in the area, to see it while some individuals made attempt to secretly plunder or rob some items because of their mentality that the some of the items might contain gold or precious ornaments. Modhumangol, estimated the excavation led and conducted under the guidance of Professor Kunjeshowri lasted for fifteen days during which many students of the history department including Ph.D. and other scholars slept on the front portion of their residence to guard the site which had become a sensational discovery of the 21st century Manipur. In fact, it can be considered that the discovery is the next to the significance to Sekta burial mounds as far as ancient or medieval history is concerned. Families of the discoverer also remarked that some weapons were also found which includes four axes and some swords. The authenticity of the claims of the family cannot be concluded. They also claimed that some wooden planks of approximately three feet in height were found aside the wooden coffins. The eldest of the family and wife of Modhumangol also said some of the articles discovered had floral designs while some of them have been intricately carved. Although clearly established that the discovery of the burial site was significant to understand the culture and roots of the Meeteis, prior to forced imposition of Hinduism during the reign of King Pamheiba in the early 18th Century, concerned authorities stopped and neglected after the excavation was completed to some extent. Family members claimed that the authorities made assurances that they would take measures to maintain the site and but did not kept their promises. Additionally, the family members did not renewed or purse their demands to have the site being properly protected. They further claimed that the government had assured to fill up the site from their side but did not do so. However, the tragedy is that such significant site, due to economic circumstances of the family, had forced them to convert the site as a place of rearing cows. Nevertheless, the wife did said, following the discovery in 2010, they had maintained the site as a sacred place and conducted daily traditional Meetei prayers at the site along with lighting of candles for almost two years but was later abandoned as the site had to be transformed into a place for pursuing planting vegetables and others as a result of economic necessity. This article was posted on October 20 2015.